Whether it’s a meeting for a specific time or remembering to stop the tea brewing in 7 minutes time (lovely tea from Adagio Teas that deserves it’s own blog post) events often whiz by without me noticing. I’m not great at time based background threading… but a computer is. Sure I fire up Outlook (which I don’t use any more), iCal (Only open when I need it) or Google Calendar, create a new event, choose the type, choose which day and time it occurs at and mentally do the math in my head for 7 minutes from now taking the seconds into consideration…. but that’s distracting enough I think “No, I’ll just remember” and I don’t. 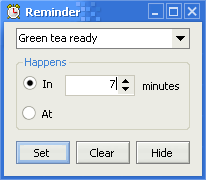 What I want is to make a few clicks to set-up an event – ideally based on previous ones such as another “Green tea brew”. I don’t want audio alarms just a pop-up silent balloon that completely disappears with another single click. Inspired by App-A-Day I thought “what the hell” and wrote it. Download QuickReminder (.NET) with full source (29KB).